We were thrilled to work in partnership with landscaping giant, Whiting Landscape on their latest redesign of Rugby Road Park in Hinckley. We were approached by Whiting Landscape to help them bring an element of sport and exercise into their project by designing, manufacturing and installing an exciting multi use games area. Our work included the excavation of grass to create a new tarmac pad to accommodate the MUGA and make it suitable for two sports, football and basketball. 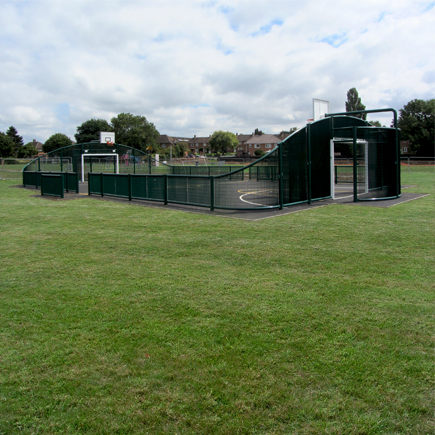 We designed a 20m x 12m MUGA using our Heavy Duty Sports Fencing creating a beautiful arched fence line along the goal end, reaching the height of 4m. The arch slopes down into curved corners to continue the flow of the shape and to help keep the ball in play when bounced against the curved wall. Our Heavy Duty Fencing range is an extremely heavy duty system and provides superior resistance to vandalism and abuse, making it ideal for a public area. The steel is hot-dipped galvanised to prevent rust and is powder-coated to prolong the paintwork. The fencing carries a 25 year guarantee. During a recent test, our heavy duty system was proven to be 50 per cent quieter than the industry standard twin wire system when hit by a ball at high speed. Please see the download for further information about this project.